Once again it is that time of year that makes me remember how much I love sports. The NCAA Men’s Road to the Final Four has begun, and I couldn’t be more excited for this weeks Sweet 16. This years Dance has already been unbelievable with buzzer beaters, shockers, cries of joy, and tears. I have already ordered my Sweet 16 tee for this weekends tourney, what about you? 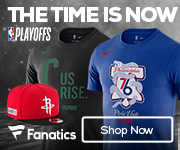 Check out all the great NCAA tournament and college team gear from Fanatics below!